Both IBS and microscopic colitis share the symptom of chronic diarrhea. Thus it is understandable to wonder if they are related. The treatment for the two conditions is very different - therefore you will want to be assured that you have the right diagnosis. In this overview, we will look at what microscopic colitis is and how it differs from IBS. Microscopic colitis is a condition in which a person experiences chronic watery, but not bloody, diarrhea. 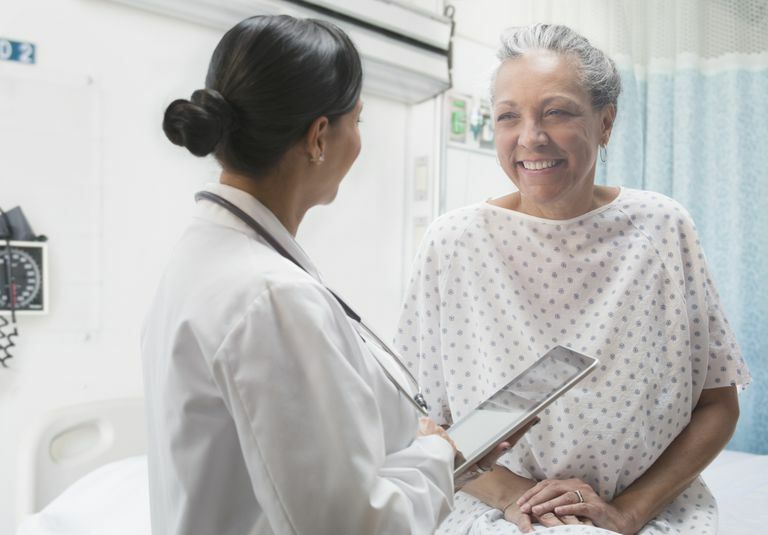 The disease is more likely to affect woman than men and your risk goes up as you age, with the highest incidence seen in people who are in their 60s or 70s. There are two types of microscopic colitis: Collagenous colitis and lymphocytic colitis. They differ in terms of the way they look but are possibly just two different stages of the same disorder. Regardless of type, the two disorders are diagnosed and treated the same way. In lymphocytic colitis, there is an increased number of white blood cells present in the tissue of the lining of the colon. In collagenous colitis, a thick layer of collagen is seen in the tissue. Symptoms may be intermittent and at times, the disease can resolve on its own without any medical treatment. Similar to IBS, with microscopic colitis, there is no sign of the disease seen during a colonoscopy. Where the two disorders differ is that microscopic colitis will show up when a sample of colonic tissue is looked at under a microscope. In addition to the colonoscopy with biopsy, other tests will be given to rule out other diseases. Blood work, with possible endoscopy, will be recommended to rule out celiac disease. A stool test may be recommended to identify any pathogens that might be causing the diarrhea. As you will see, the treatment options for microscopic colitis are very different than the treatment options for IBS. The first step may be to have the patient stop smoking or discontinue any medications that are suspected as contributing to the disease. Medications may be prescribed. At its worst, microscopic colitis may be addressed through ileostomy surgery. Having learned about microscopic colitis, you still may be wondering if you have the correct diagnosis. A recent meta-analysis looked at the results of numerous studies on the topic. Combining data from these studies, the authors concluded that although approximately one-third of patients who have microscopic colitis report IBS symptoms, this percentage did not differ from people who do not have microscopic colitis. The overlap between IBS and microscopic colitis differed depending on study design. In case control studies, microscopic colitis was seen more often in people who have IBS than those who had no symptoms. But in studies that looked at evidence across large groups, people who have IBS are no more likely to have microscopic colitis than people who have diarrhea but who don't have IBS. Based on this meta-analysis, the authors recommend that unless you are at higher risk for microscopic colitis (based on the above risk factors) or any red-flag digestive symptoms, there is no need for a person with IBS to undergo a colonoscopy to rule out microscopic colitis. Of course, if your IBS symptoms change, you should inform your doctor, with this expectation that further testing may be warranted to obtain an accurate diagnosis. Why are the symptoms of IBS and microscopic colitis similar, although they are different diseases? Certainly, low-level inflammation has been associated with IBS. The answer may be that they lie on a continuum. Hopefully, continued research will help to make the issue much clearer. Kamp, E., Kane, J. & Ford, A. "Irritable Bowel Syndrome and Microscopic Colitis: a Systematic Review and Meta-analysis" Clinical Gastroenterology and Hepatology Articles in Press Published Online October 7, 2015. "Microscopic Colitis" Mayo Clinic website Accessed October 16, 2015. Park, T., Cave, D. & Marshall, C. "Microscopic colitis: A review of etiology, treatment and refractory disease" World Journal of Gastroenterology 2015 21:8804–8810.